If you’re reading this post and wondering what the heck is an Israeli carrot, don’t worry, you’re not the only one. We had no idea such things existed until a couple of weeks ago, when we saw them at the market. Israeli carrots are just like regular carrots, but slightly sweeter and well, gigantic. Think carrots on steroids. No, seriously! These things are so big, they could be used as weapons! Now whether they come from Israel or not, we don’t know, but they sure are delicious! And perfect to satisfy my carrot “obsession”, which started when I was a chubby 8 year old trying to lose weight. Yep, I was awfully young when I went on a diet for the first time. And not by choice, believe me. I loved food way too much back then to give up anything… But my doctor said I “had to”, so I pretty much had no choice. That’s when carrots became my best friend. I remember my mom would shred pounds at a time and have them ready in the refrigerator for me to snack on whenever I was hungry. I would cover them with mustard or lemon juice and salt and done! Maybe not the most appealing snack for an 8 year old, I know… But it worked for me. And at one point I ate some much of it, my skin started to literally turn orange. Now fast forward 25 years… And still love them, even though I’m not on what you would call a “diet”. And my skin still has a slight orange tint to it, but I’ll have to blame the lack of sunshine for that one! Wow!!!! 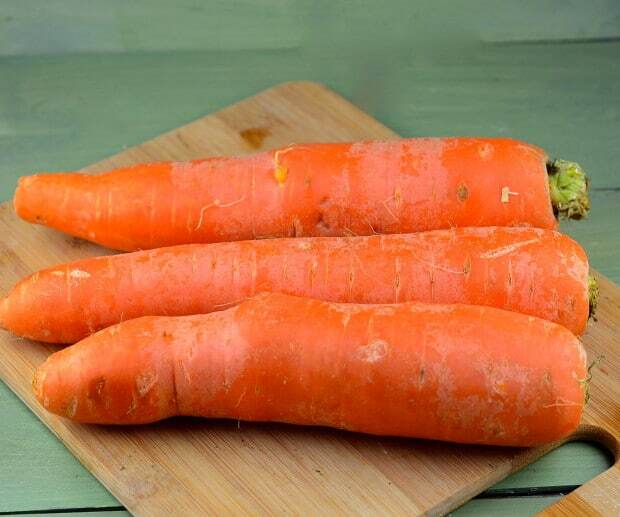 These ARE huge carrots…I’ve never seen something so big! I also have a carrot obsession, especially with your delicious homemade hummus recipe! This looks so good! I love the idea of a crisp quinoa as a topping! Thanks!! We just LOVE quinoa… We try to use it in any way, shape or form possible, haha!! 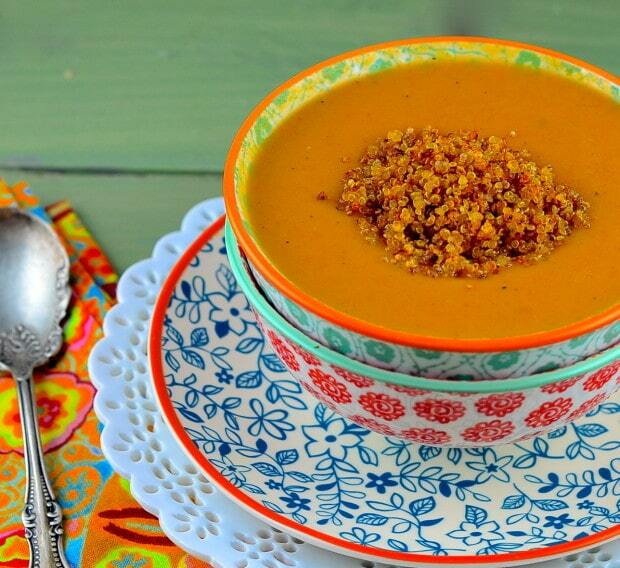 This soup is gorgeous! I ate a ton of steamed carrots, squash and sweet potato kick with ginger carrot dressing when at NYU – got the “dish” from a vegan restaurant in the city and wouldn’t ya know my face and the palms of my hands turned orange! and BTW – the carrots in Israel are small?!?! I have missed my big carrots — too funny. This looks amazing! I love that you added that quinoa topping! Adds so much protein. Thank you Hindy! Can’t go wrong with some added protein and a little crunch! First of all, welcome to the KC! Secondly, your pictures are so beautiful—they match this gorgeous recipe perfectly!! Thank you so much!! Very excited to be part of the KC! Great job with this recipe!!! I am printing it to try this week! Thanks girls! Thanks!! Glad you liked it… This recipe is perfect for the warm summer days. Hope you enjoy it! I must get my hands on those carrots! I love those big fat carrots, but never knew they were Israeli. Love the topping idea here too, so great. Tamar, we had no idea they were Israeli either. We were so intrigued when we fist saw them that we had to buy them! I am totally feeling that chewy quinoa topping! I like the texture contrast with the soup. 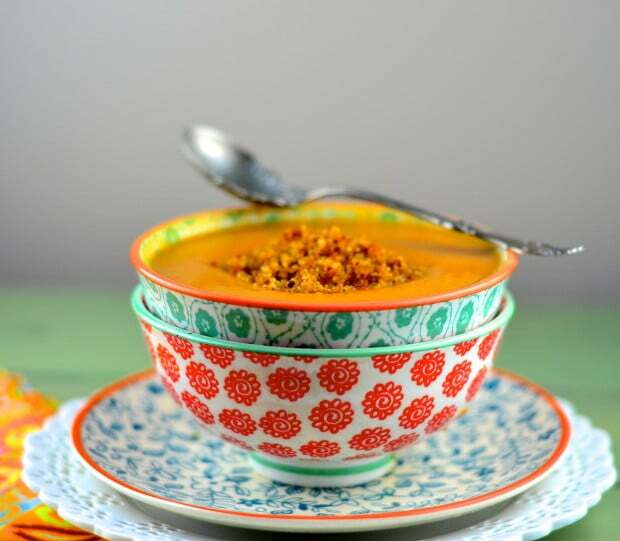 I love carrot soup and your beautiful pictures make me want to dive into a big bowl right now! 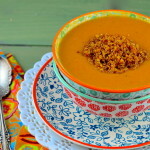 I always have tons of carrots on hand so this soup is going on the menu this week for sure. Thank you! Glad to see I’m not the only one with a “carrot obsession”, haha! Hope you enjoy it! Lovely soup. I like the way you coordinated the different prints on the soup bowls. Welcome to the club! The soup ingredients are perfect and I never would have thought to crisp up quinoa but now I will think about it for other recipes, so thank you. Am I right in thinking that you use 1/2 cup UNCOOKED quinoa? But you don’t cook it the usual way, you just crisp it up in the pan? Thank you Ronnie! For the topping we do use cooked quinoa. Look at step 2 in the instructions. We cook it slightly “al dente” so I doesn’t get all mushy and crisps up a bit. Let us know if you have more questions! I’ve seen carrots this big, but I didn’t know they were called Israeli carrots! The flavor is really better than the carrots in the bags – I bet this soup was so good! Fabulous photos ! Can’t wait to try this recipe.. I’m pinning it right now. Love it!! This was delicious! The only thing I did differently was omit the cooking! I added one whole navel orange, peel included, and blended on highest setting. Yum! I am so thrilled to have discovered your blog! This is the first of your recipes that I’m giving a whirl. The mixture is simmering as I write. Hopefully I’ll be able to still rate the recipe after I have a taste. It is sooooo hot in TX right now- I cannot get enough chilled soup. Do you think it can be frozen? Great recipe. I add a little bit of coconut milk, which went well with the spices. 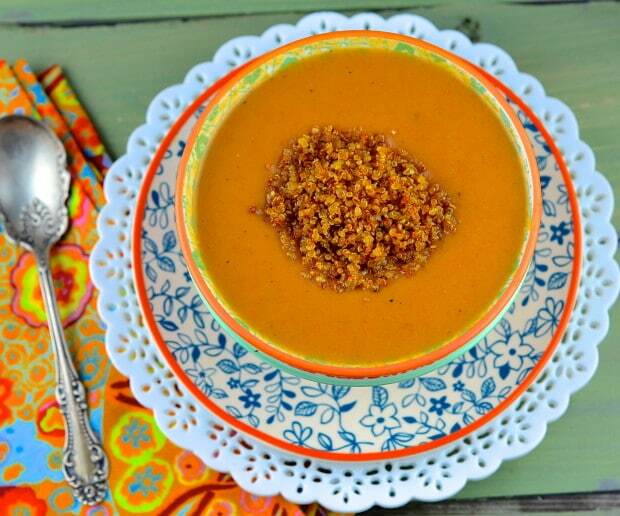 I plan on making this again in the fall – because it also tastes great warm. Thank you for sharing! We love carrots and coconut milk. Great variation!